In general it is a mindless task to migrate things that have been changed due to a new major release. For JUnit 4 one of the most popular features, which are new compared to JUnit 3, is the usage of Annotations and Pojos for test classes. Quite a lot of work, if you have to do it manually, isn’t it? In order to automate this “mindless task” a bit, I started to write a migration plugin, which is available on GitHub and also as p2 updatesite on bintray.com. 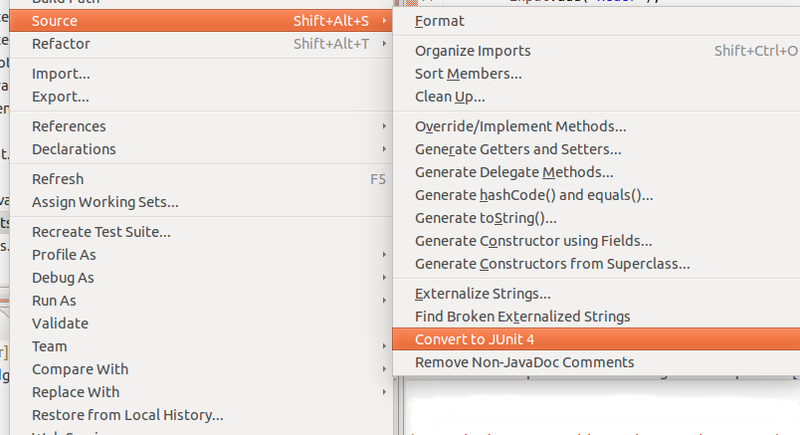 After you have installed this plugin you can trigger the follwing action on every Java project, java package or java class in the package explorer by selecting Soure > Convert to Junit 4. As one of our aims at the vogella company is keeping the Eclipse code clean and modern the migration of the Eclipse tests to JUnit 4 is currently in progress. 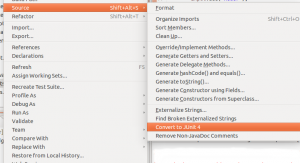 This entry was posted in Eclipse, Java, Simon Scholz and tagged Eclipse, JUnit 4, Migration, Tool. Bookmark the permalink.